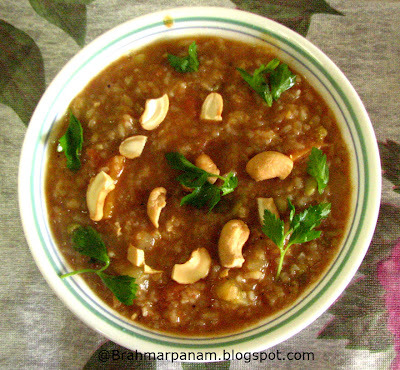 Bisibele Bath is famous in Karnataka and is an easy single dish meal. It is very healthy and filling and can be made in a jiffy especially if you have guests visiting your place. This recipe serves 4. In a pressure cooker, drain and add the soaked rice and toor dal, vegetables, peas, Lima beans, tomato and turmeric. Mix well. Add 5 cups of water, tamarind paste, rasam powder, bisibele bath powder and salt. Mix everything well and pressure cook for 4 whistles. Heat ghee in a small pan and add the mustard. When it crackles add the cashews/ peanuts and fry them till golden brown. Then add the asafoetida and curry leaves. Add the seasoning to the bisibele bath and serve it hot! The Rasam Powder and Bisibele Bath Powders can be either homemade or store bought. The vegetables added to the Bisibele bath can be anything of your choice. But if you are adding, capsicum/ cauliflower/ broccoli/ any veggie that gets cooked fast, cook them separately and add it in step 4 and stir well. Cover and simmer for 5 min so that the veggies soak in the flavour.